Obituary – Kennedy, Sara Eloise « Perry High School Alumni Association, Inc.
Sara Kennedy, 89, Perry, died at 1:05 a.m. Wednesday, Jan. 31,1996, at Perry Memorial hospital. Funeral will be at 2 p.m. Friday at the First Presbyterian church. Rev. Jim Murray, interim pastor, will officiate. Burial will be in Grace Hill cemetery under direction of Brown Funeral home. Memorials may be made to the First Presbyterian church. 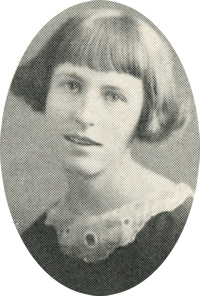 Born Feb. 25, 1906, at Perry, Miss Kennedy was the daughter of Elias Marion and Mattie (Gowty) Kennedy. She was a 1924 graduate of Perry high school and had worked as an operator and service representative of Southwestern Bell Telephone for 30 years. Miss Kennedy had been a member of the First Presbyterian church since 1920 and had been the church organist for 20 years. She was a member of the United Presbyterian Women and Friendly Community Fellowship. She was preceded in death by her parents and four brothers. Among survivors are five nieces: Donna Golliver, Enid, Warenne Harris, Canoga Park, CA, June Jerome, Shawnee, Marjorie Talbot, Universal City, TX and Betty Anderson, Prague; and a nephew, Bob Kennedy, Shawnee.